The best, healthy ingredients from the earth, mixed into a delicious daily meal. Protein rich chicken, blueberries, flavorful rosemary, sage and thyme are just a few of the nutritious ingredients. Made with no corn, wheat or soy. Packed with delicious flavor from healthy ingredients your pal will love. 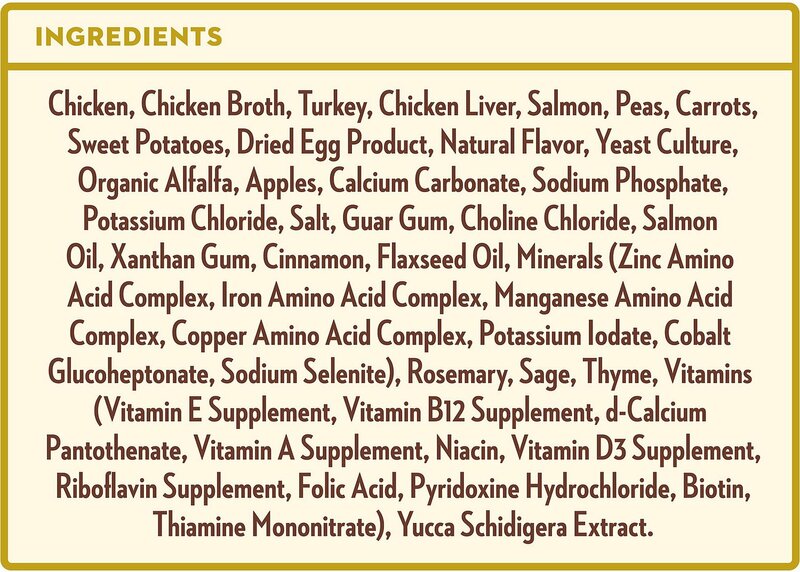 Chicken, Chicken Broth, Turkey, Chicken Liver, Salmon, Peas, Carrots, Sweet Potatoes, Dried Egg Product, Natural Flavor, Yeast Culture, Organic Alfalfa, Apples, Calcium Carbonate, Sodium Phosphate, Potassium Chloride, Salt, Guar Gum, Choline Chloride, Salmon Oil, Xanthan Gum, Cinnamon, Flaxseed Oil, Minerals (Zinc Amino Acid Complex, Iron Amino Acid Complex, Manganese Amino Acid Complex, Copper Amino Acid Complex, Potassium Iodate, Cobalt Glucoheptonate, Sodium Selenite), Roesmary, Sage, Thyme, Vitamins (Vitamin E Supplement, Vitamin B12 Supplement, d-Calcium Pantothenate, Vitamin A Supplement, Niacin, Vitamin D3 Supplement, Riboflavin Supplement, Folic Acid, Pyridoxine Hydrochloride, Biotin, Thiamine Mononitrate), Yucca Schidigera Extract. How much food your dog eats each day is dependent upon size, level of activity, stage of reproduction, and environment. When feeding in measured amounts, feed according to the weight of your dog. 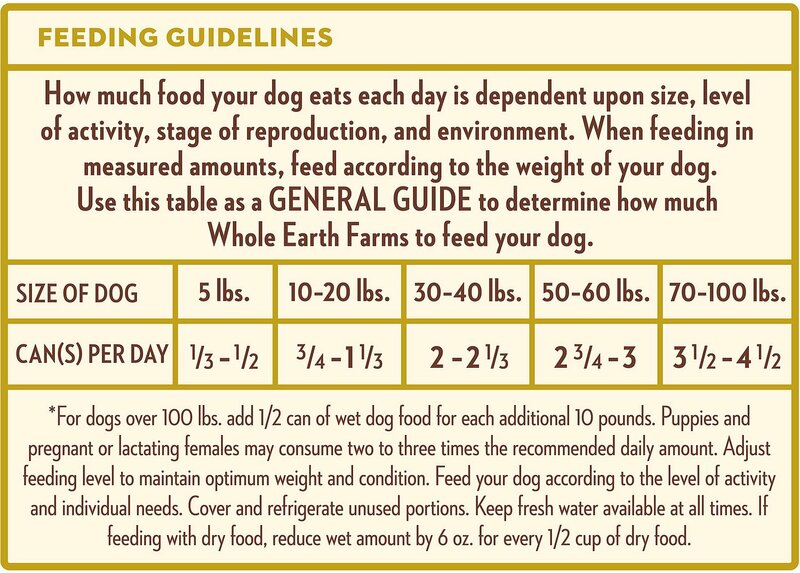 Use this table as a GENERAL GUIDE to determine how much Whole Earth Farms to feed your dog. *For dogs over 100 lbs. add 1/2 can of wet dog food for each additional 10 pounds. Puppies and pregnant or lactating females may consume two to three times the recommended daily amount. Adjust feeding level to maintain optimum weight and condition. Feed your dog according to the level of activity and individual needs. Cover and refrigerate unused portions. Keep fresh water available at all times. If feeding with dry food, reduce wet amount by 6 oz. for every 1/2 cup of dry food. 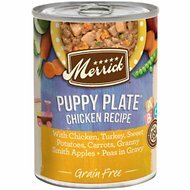 We recently added a new puppy to our family and this is our go to puppy food. 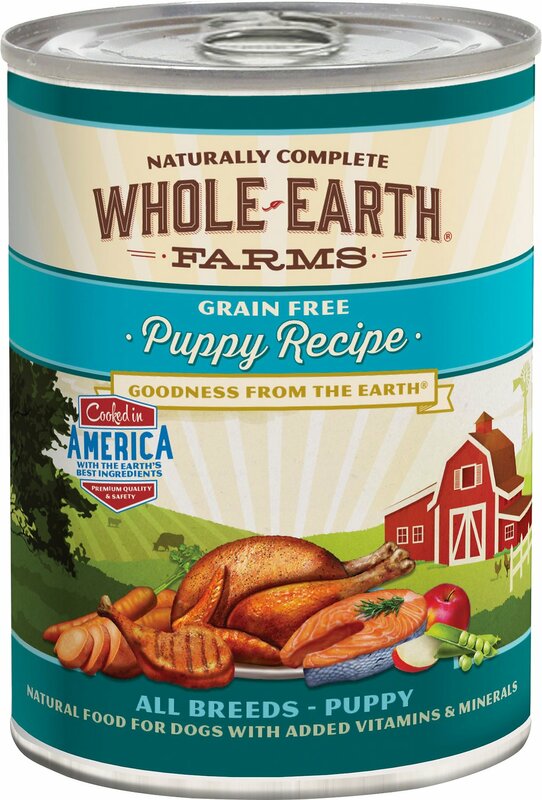 We have used it (and other Whole Earth Farms foods with all of our dogs). 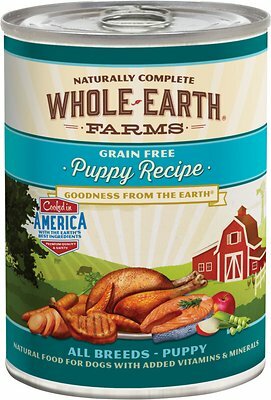 It provides great nutrients for a little growing puppy. We were super stoked on how fast it was shipped to us. Also, the packing was excellent. There were box sleeves over the top of the packs of food to protect them from denting during shipping. We were very pleased and will be ordering more for sure! 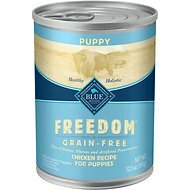 Great Puppy food - He loves it! Was not sure of the brand but read some review and bought a case along with Wellness puppy. My GSD puppy loves it and I love the pull tab can top! So far, one can of food was half full when opened. Not sure how that happens, but I didn't use it (even though it was sealed and looked normal). Wish they had more flavors for puppies, but other than that I have nothing but good things to say. It's a decent size for the price, more affordable than other holistic options, and much easier on my dog's digestion. I can definitely tell a difference. 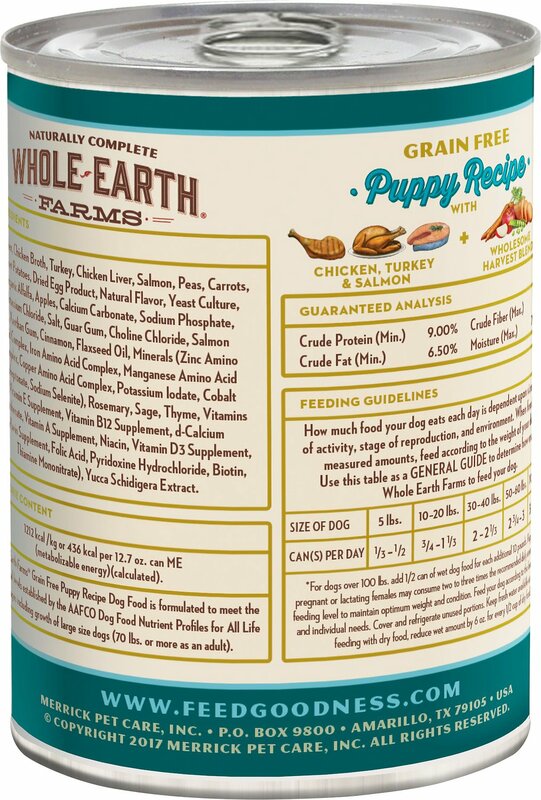 My puppy loved this food. We mix it with a dry food for her and she eats it right up. We where having a problem with her eating and when we tried this food she just loved it! 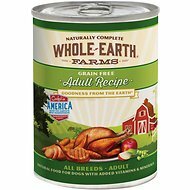 Our dogs love this food. We put a spoonful on top of their kibble to make every meal special. My new pup loves this product. It was a very easy transition from the puppy chow she was eating with her previous owner. and there has been no upset stomach or loose stools with the switch. Gotta go with the taste test. My puppy won’t eat this, but devours Newman’s Own Organic food. I have been giving my puppy this brand for a while, so nothing new happened. It appears fresh and you can see the vegetables in it. Having it delivered is great. But I am now waiting for the order I just made on Thursday. I haven’t received it yet.